KHARTOUM, Nov 02 (IPS) - The day before Amnesty International released a statement calling on the government of Sudan to end harassment harassment, intimidation and censorship of journalists following the arrests of at least 15 journalists since the beginning of the year, the head of the National Intelligence Security Services (NISS) Salah Goush accused Sudanese journalists, who recently met with western diplomats, of being spies. "They were called and interrogated to let them know that is a project of spying," said Goush to Sudan's parliamentarians on Thursday Nov. 1. He then announced that the NISS was dropping all complaints against the journalists. At the time they were told that they might face charges when the investigation finishes. Prior to Tuesday, five other journalists were also interrogated for meeting the same diplomats and the NISS states that two more journalists are to be questioned on the same matter. "What NISS is doing with us is a form of extortion and it's a terror act to stop freedom of the press. Journalists have the right to meet diplomats, government officials and opposition and anyone else and they can talk to about freedom of speech or anything else. Journalists are not spies," Bahram Abdolmonim, one of the three journalists interrogated by NISS on Tuesday, told IPS. He added "journalism is a message". Journalists' reporting is tightly restricted to only certain parts of the country, especially conflict zones like Darfur, Blue Nile and South Kordofan states. "The Sudanese authorities must stop this shameful assault on freedom of expression and let journalists do their jobs in peace. Journalism is not a crime" said Jackson. 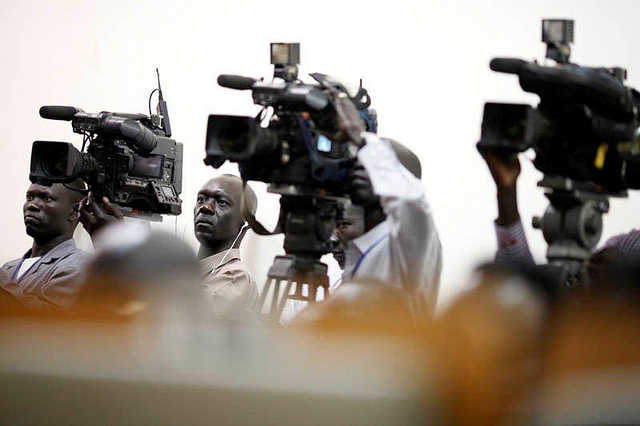 Journalists in Sudan are often arrested and taken to court where their face complaints that ranges from lying to defamation. "We work in fear in here, when I write something I'm not sure if I will end up going to jail or being interrogated by the NISS," says one journalist who preferred to remain anonymous for fear of their safety.